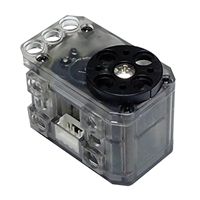 The DYNAMIXEL XL-320 is a robot smart actuator with a fully integrated DC Motor + Reduction Gearhead + Controller + Driver + Network in one small DC servo module. The XL-320 has a high performance and precise control as compared to its compact size. Uses TTL communication and can be daisy chained to help construct robots easily. High reliability and accuracy for position control with PID control. Built-in clutch for reduction gear protection to improve durability and safety. There is a three color LED which can be programmed for display. Used on the DARWIN-MINI. 0.9" x 1.4" x 1.1"